So the soldiers did this. But standing by the cross of Jesus were his mother, and his mother’s sister, Mary the wife of Clopas, and Mary Mag′dalene. When Jesus saw his mother, and the disciple whom he loved standing near, he said to his mother, “Woman, behold, your son!” Then he said to the disciple, “Behold, your mother!” And from that hour the disciple took her to his own home. After this Jesus, knowing that all was now finished, said (to fulfil the scripture), “I thirst.” A bowl full of vinegar stood there; so they put a sponge full of the vinegar on hyssop and held it to his mouth. When Jesus had received the vinegar, he said, “It is finished”; and he bowed his head and gave up his spirit. At the foot of the cross were the three Marys, and the disciple, John, whom He loved. All of the other Apostles abandoned Him and hid in fear for their own lives. These faithful ones followed Jesus to the foot of the Cross, not fearing any man, but staying close to their Lord under any circumstance. Jesus is in extreme pain and suffering, yet some of His last words were in concern for His mother. From the beginning, His mother accepted the call of God. She encouraged His first public miracle at Cana. She was not only His mother, but His closest disciple and she came to love Him not just as her Son, but also as her Lord. She was now suffering along with Him, her heart also pierced as prophesied by Simeon. Mary was now about to lose her Son. Jesus could not leave her without having someone take care of her, so He tells her, “Woman, behold your son.” He then turns to John, “Behold, your mother.” With these words, Jesus is giving His mother to His beloved disciple – not only was He giving John, but He was also giving all of His disciples Mary to be our mother. Through the crucifixion of Jesus upon the cross, we became adopted sons and daughters of God. If God is our Father, and Mary is the Mother of God, that also makes her our mother! Jesus says that He is thirsty and is given vinegar with hyssop. This fulfilled scripture and is a reference to the original Passover where they use a bundle of hyssop to paint the blood of the slain lamb on the doorposts. Finally, Jesus utters His last words, “It is finished,” and He gives up His spirit. Death did not overcome Jesus; He chose when to go to God. All had been fulfilled. Jesus completed the work the Lord had sent Him to complete and He no longer needed to hang there for days as was common with crucifixion. If it were not for our faith, it would be unbelievable that one man could change the entire world as Jesus did, from His birth, to His miracles and teachings, to His suffering and death. We need no other savior or king or popular leader. We have Jesus. It is finished! It’s 3 o’clock somewhere. 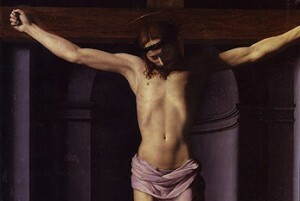 Get on your knees and look up a Jesus upon the cross. My God, my God, Thank you for not abandoning me! My heart is broken by the pain and suffering you went through during your Passion. Thank you for taking my sin upon that cross, and for washing me clean by your blood. I look forward to the Empty Tomb! Amen.